Versatile System - If an additional system is bought, the kits can be connected together as follows; 2 Indoor units - 1 Outdoor Unit. 2 Outdoor Units - 1 Indoor Unit. 2 Outdoor Units - 2 Indoor Units. The indoor unit which answers the call takes control of the outdoor unit rendering any other indoor and outdoor units inactive. If you have 2 outdoor units and 2 indoor units, the advanced chipset of our units mean than only the relevant door is unlocked (when the key button is pressed). 100m Range - Multiple Systems Can Be Used TogetherWhat is included?Digital TFT 4" Colour Screen With Handset - 320 x 240 RGBEasy To Fit Bracket & Screws - For Indoor UnitOutdoor Rainproof Unit - Night Vision (Via IR LEDs) Tilting CameraPower Adapter - 100-240V 50/60Hz, 13.5V DC Output 0.6A3m Of 4 Core Cable - For Short Distance InstallationQty 2 - Short 4 Core Plug In Fly Leads; For connecting to additional cable when system is being used over a long distance. 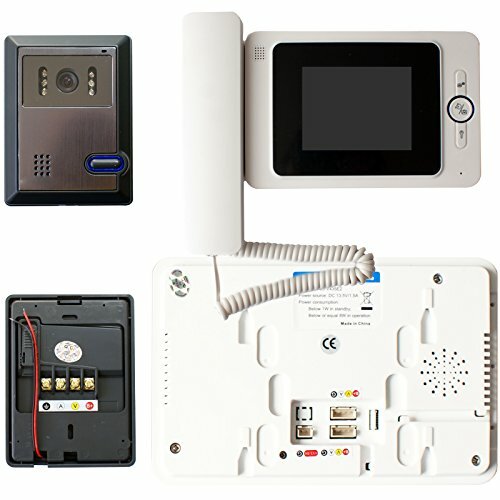 Also required for multi system setup, more information below.How to use?The outdoor unit of this kit can be installed at any door. The indoor unit (with handset) is then placed indoors wherever it is most convenient. Visitors then press the button on the outdoor unit, which rings the indoor unit. The two units act as an intercom, allowing visitors to be spoken to and viewed on the screen from the indoor unit, (via the outdoor unit's speaker, microphone and camera). The indoor unit works with the supplied power adapter and powers the outdoor unit too.For long distance use, two runs of '2 core pure copper speaker cable (0.75mm² area recommended)' can be used for running between the indoor and outdoor unit. If you need help selecting this cable, please give us a call. Using this cable, the video door phone system has been tested to 100m. To use the 'key unlock' function, there is a 2 core cable that comes out of the outdoor unit (can be seen on the picture). It is a 'normally open (NO)' circuit, therefore when the 'key button' is pressed on the indoor unit it creates continuity between the 2 cores. This should be compatible with the majority of door entry systems on the market.